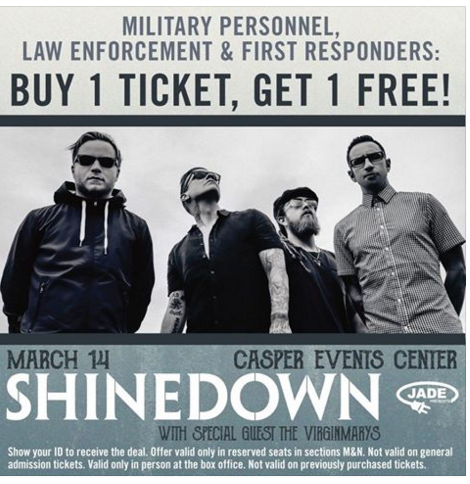 Shinedown and The VirginMarys are live at the Casper Events Center on Monday, March 14th. All Military Veterans, First Responders, and Law Enforcement personnel have the opportunity to purchase a ticket and bring a friend free. "We can't begin to know the sacrifices they make for our country and certainly time away from their family. It's our chance to say thank you in a small way. We appreciate them, and we want to somehow say thank you to the Casper community for supporting businesses like ours. We hope to continue presenting live music in your fine city," said Melissa Kucirek Public Affairs Director of Jade Presents. You must present ID to receive this deal. Seats are in sections M & N. Not valid on GA tickets. Valid only in person at the box office. Not valid on previously purchased tickets.